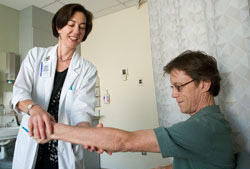 The University of Washington Department of Rehabilitation Medicine has an international reputation for excellence in patient care. Our team of physicians and healthcare providers maintains the highest standards of patient-centered care by developing individual rehabilitation plans for every patient. This comprehensive approach to care addresses all of the needs of our patients and their families. Because we recognize that the support and encouragement of loved ones is vital to our patient's successful recovery, our patient care teams make every effort to include family and friends in all aspects of the rehabilitation journey. It is important to recognize the signs of a urinary tract infection. Because many patients with spinal cord injury must empty their bladders by intermittent catheterization, they are more likely than most people to get bacteria in their urine.